This review is of the cut shown at the BFI London Film Festival in October 2016 – the UK release date is currently listed for February 16th 2018. The solo directorial debut of Greta Gerwig (her first actual director’s credit was in 2008 when she co-directed Nights and Weekends with Joe Swanberg) turned out to be this year’s “Surprise Film” at the BFI London Film Festival, which is usually reserved for a film that wasn’t featured on the original programme but scheduled to come in when people were least expecting it. That’s a good way to describe the sudden nature of Lady Bird, which comes almost out of nowhere to win you over and entertainingly tell a story of teenage frustration and rebellion from a genuinely unique perspective. 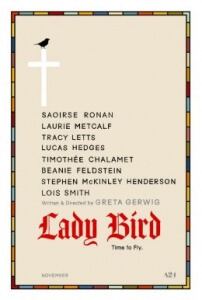 Gerwig takes cues from Woody Allen and crafts a character that represents a caricature of her on the big screen, but it’s not as arrogant or self-aggrandising as that may sound; her on-screen surrogate is a young woman named Christine (Saoirse Ronan) who prefers the moniker “Lady Bird”, who we first see getting into an argument with her equally as snarky and passive-aggressive mother (Laurie Metcalf) while driving around and discussing colleges. Her mother wants her to go somewhere closer to their home in Sacremento while Lady Bird would rather head to the East Coast where she claims there to be more culture and interesting people, and when the argument gets too much for her she decides to bail and jumps out of the moving car, damaging her arm and leaving her in a bright pink cast for a large chunk of the movie. That sets the tone for this wildly funny and deeply honest look at this young girl’s life as she survives her final year at a Catholic high school, mucking about with her best friend Julie (Beanie Feldstein) and lusting after classmates Danny (Lucas Hedges) and Kyle (Timothée Chalamet), while constantly clashing with her similarly-minded mother. Gerwig doesn’t exactly change the game with this story about a teenage girl surviving her life as she completes high school, which has certainly been done many times over, but she manages to find a way to make it feel even fresher than ever, and not since last year’s The Edge of Seventeen has there been a teen movie like this that really dives into the damaged psyche of its lead protagonist as they go from one awkward situation to another, although this one is a lot sharper in its wit and comic delivery. For years, Gerwig has thrived from appearing in countless quirky indies from Frances Ha to Maggie’s Plan, and has definitely taken those experiences to heart and made her own film in that vein which feels very much her own, even if this time she doesn’t even step in front of the camera. The dry humour of some of her previous directors like Noah Baumbach and Mike Mills is present, but the film’s biggest laughs come more from a place of sincerity and rely a bit more on the snarky and wit-fuelled dialogue rather than just the awkwardness of the situation. As a debut director, this is an incredibly strong first project, one that focuses on being funny as much as it does on being a thrilling character study of this complicated but certainly wise young woman finding her place in the world somewhere that she doesn’t even like (she calls Sacremento “the Midwest of California”). She has found a great on-screen surrogate in Ronan, who is electrifying here in one of her funniest film roles to date, not least because she has been blessed with such a colourful character to portray, but also due to her natural magnetism that draws you in more and more even when you see how lost she really can be as a character. Metcalf, too, is outstanding in a role that’s not very sympathetic but also just as layered as her on-screen daughter, as we all know people who have parents like this and find themselves just as frustrated with them when their personalities clash in some very uncomfortable ways, but Metcalf does manage to humanise her by the end even when she doesn’t seem to be at all likeable in the personal decisions that she is making. Their mother-daughter relationship serves as the crux of the film, and helps explain a lot about Lady Bird and her sardonic view of the world because it’s likely a lot of it came from someone with her own personality issues but has her child’s best interests at heart, even though sometimes they can be clouded by her own selfishness. The comedy is often laugh-out-loud funny, and helps elevate the film even in some of its more upsetting and surprising moments, especially when mother and daughter end up clashing every other scene in the movie. When you’re not chuckling greatly along with the witty dialogue and amusing character anecdotes, you’re really feeling for this main character who’s not always easy to like, but you do anyway because she is just living her life how she wants to and takes a sardonic perspective that hilariously contrasts with a lot of the more upbeat characters in the film. It’s an emotional movie, leaving you feeling happy, sad, joyous, depressed, and many other similar things, but what makes it an even stronger movie is the raw honesty that Gerwig brings in both her writing and direction, and the lead actress she got to represent these feelings on the big screen. I now see why the London Film Festival waited to reveal this as a “Surprise Film”, because given its raw ferocity and genuine emotional impact, how could anyone not call this one of the nicest surprises of the year? Lady Bird is an exhilarating debut from writer-director Greta Gerwig who has made the strongest teen movie since The Edge of Seventeen, and brings a delightfully sardonic sense of humour to the proceedings thanks to her strong efforts as a filmmaker, as well as those of her extremely talented lead actress Saoirse Ronan who has never been funnier or emotionally poignant in a movie.